Take the guesswork out of watering with GardenSoxx. Water is an important transport medium that allows nutrients to travel from soil to the plant cell. It can be a challenge to determine the exact needs of a plant. Insufficient and excessive watering are the most common reasons a plant might fail despite what seems ideal conditions and care. Under watering inhibits nutrient intake causing the plant to dehydrate. Over watering can reduce oxygen supply and promote pest or mold issues. GardenSoxx® provide superior aeration making it difficult to over water. It is important to water GardenSoxx thoroughly and often because Filtrexx® GrowingMedia™ or compost needs moisture to ensure that the microorganisms that provide nutrients are staying alive. GardenSoxx can easily be watered with a Drip Irrigation Kit, Rain Barrel Reservoir, watering can or hose. Apply water directly to the GardenSoxx. We recommend a half-gallon of water per day for every 2' of GardenSoxx, but can vary by climate. Harvest the rain and reduce costs with a rain barrel. A rain barrel is a low-cost water conservation device used to collect and store rain water. Rain barrels store and divert runoff from impervious surfaces and reduce the undesirable impacts of runoff that would otherwise flow into sensitive receiving waters. Municipal water contains chlorine, fluoride and other chemicals that can cause an imbalance in growing media. Even well water contains iron and other minerals that can also build up and harm sensitive plants. Rainwater does not contain the same additives found in tap water, resulting in healthier plants. Elevate the rain barrel to provide sufficient water pressure. A five-gallon bucket elevated 30” and connected to drip irrigation (without pressure reducer) provides a 40-minute drip throughout a 4’ x 8’ garden. For best results, monitor water daily, especially in hot, dry weather. 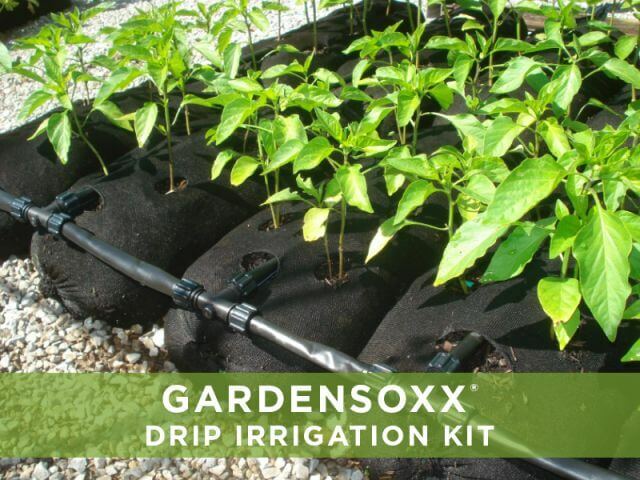 Reduce water waste with the GardenSoxx Drip Irrigation Kit. Our unique mesh technology makes planting easy. Learn how to plant in GardenSoxx and our recommended spacing . 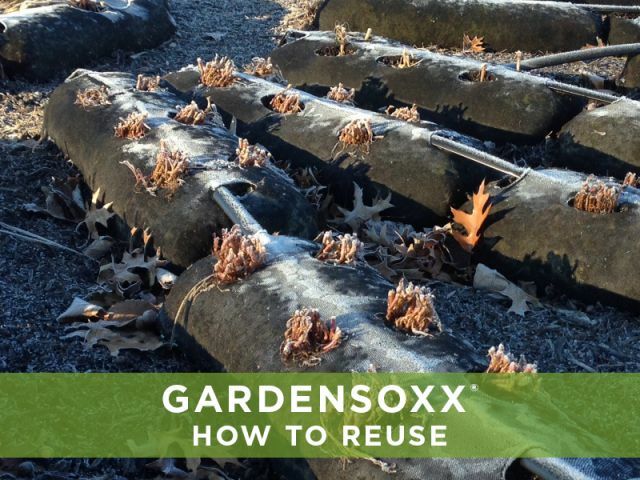 GardenSoxx can be used for multiple growing seasons. Learn how to maximize the use of your GardenSoxx.